Tammy Everts stands for the topic “page speed load” and is usually referenced to with other names like e.g. Steve Souders and Stefanov Stoyan. 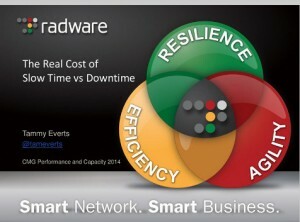 Just recently she released a presentation on “The Real Cost of Slow Time vs. Downtime“. Calculating the cost for slow page performance is ways more tricky since the impact is deferred to the actual accurance of slow pages. The talk basically differentiates between short-term losses and long-term losses due to slow pages. The long-term impact is calculated on a customer lifetime value (CLV) calculation basis. The relationship – according to studies – between CLV and performance is interesting. 9% of users will permanently abandon a site that is down temporarily – but 28% of users will never again visit a site showing inacceptable performance. Identify your site’s performance impact line (8 seconds is a good industry value). Above this timeline business really got impacted. Identify the percentage of traffic experiencing slower traffic than the impact line. Calculate loss knwoing that 28% of these customers will never return to your site. This entry was posted in Speed and tagged cost, page speed, report by Michael Maretzke. Bookmark the permalink. © Copyright 2015. maretzke ITC. All Rights Reserved.